Our main project management tool is Teamwork as you may know. Teamwork is a great tool with all kinds of advanced functionality. Alas often the basics don't work. In this case Message subscription management. 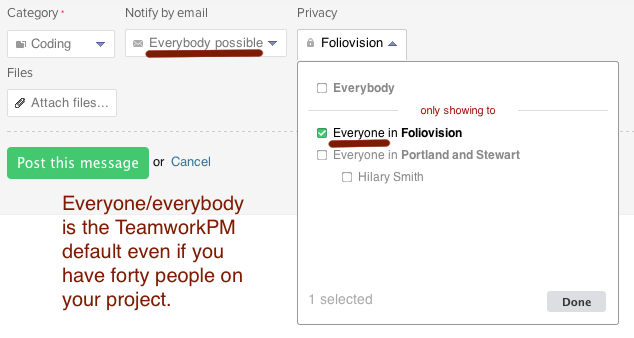 I've written to TeamworkPM about five or six times about their incompetent management of message subscriptions. In the bad old days (pre-thrashing by Foliovision), TeamworkPM tried to make everyone subscribe to every message. It was hell. Clients emailed our entire team (up to 35 people at a time) for the smallest issue. We couldn't get any work done. At last a website screenshot utility with a decent name. I've always wanted to like Paparazzi on the name alone. We hire lots of designers, many of them from the local technical university. I’m always surprised at how many of them have really crappy technical skills. It seems to go with the underlying meme in society that computers are for guys. Invariably, these designers are very concerned with doing creative work and being seen as creative. Here’s how bad it can get. Our latest hire (with a Master’s Degree in technical design!) could not even do a scan properly. She handed back jaggy 700 px x 1000 px scans of 12 x 18 photos with bad black and white points. Wake up ladies. Design is a craft. There is no more excuse for you not having first rate technical skills than for a carpenter not to be able to use a lathe properly. Perhaps they could make the argument that they are more sculptors than wood workers. 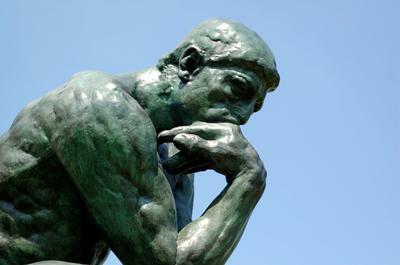 Did Rodin have to know how to use a lathe (actually Rodin worked mainly in bronze)? A lot of logos on the web look like they were run over by a truck. Blurry, jagged, hideous. Here's how to make your resized logos gorgeous and sharp. The first point is to always save your graphics and logos as either a GIF or a PNG. Saving solid colour graphics and logos as a jpeg is a catastrophe and inevitably results in nasty digital noise. This sound elementary but I have had three trained graphic designers do this wrong, including a graduate of the Art Institute of California. The only one who knew the right answer (in what format to save a text logo) was our lead programmer, Peter. For an example, one doesn't have to go further than the website of Royal Bank of Canada.